Matlock Town FC vs Gainsborough Trinity F.C. Unbeaten at home since mid September in a run of ten league and cup games, Matlock finally came unstuck on New Years Day when Gainsborough completed a league double to move three points ahead of the Gladiators. The visitors scored in the dying embers of each half through substitute Jonathan Margetts and man of the match Simon Russell and on the day were the better side as Matlock struggled to reach both the intensity and height in many of their performances of late. It was just their second defeat in sixteen league outings since the beginning of October. But boss Dave Frecklington and most of the fantastic 665 crowd, Matlock’s best of the season, would have been disappointed by the manner of the defeat. They controlled the opening twenty minutes but then fell away as the Holy Blues took over for the remainder of the half. This time after going behind, Matlock could not find an answer. On the whole the Gladiators were too predictable, they had no Plan B as central defenders Ioan Evans and Nathan Stainfield won virtually everything pumped forward in the air. After going behind, Matlock created little in terms of clear cut chances. More craft and imagination was needed from Matlock, Sadly from the home fans viewpoint, these qualities were missing in a contest billed with much promise pre match that never really got going. 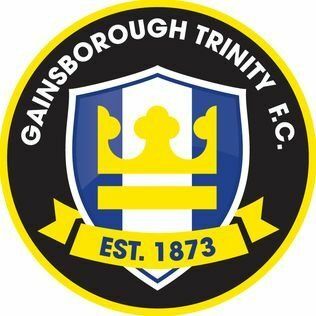 Frecklington and assistant Terry Fleming managed Trinity last season, while Taron Hare, Brad Beatson, Craig King and substitute Tom Davie were all players at Gainsborough. Matlock legend Ross Hannah was in the visitors line up in a deeper midfield role but his return to Derbyshire proved to be a brief and painful one. His first minute clattering of King on the touchline earned him a yellow card, it could easily have been a red, but in the “tackle” Hannah picked up a knee injury which saw him substituted in only the 5th minute. Seconds before the substitution, a faulty header from youngster Ashton Hall, in midfield with Cleveland Taylor having failed a fitness test, put skipper Adam Yates in peril against Alex Simmons but Yates recovered well to clear the danger. An 11th minute run and cross from Alex Byrne on the right saw Margetts nod harmlessly wide at the far post. Matlock then had a purple patch of pressure from which they desperately needed to find an end product. King headed narrowly too high when Hare’s massive throw had been flicked on and after Hall had done well to recycle possession in midfield and find Craig Westcarr, the move ended with Luke Hinsley’s shot being deflected wide. King then drove across the face of the goal, a Gainsborough touch earning the Gladiators a corner from which Byrne knocked Hinsley’s header off the line..It was as close as Matlock would come to finding the onion bag. A poor clearance from goalkeeper Ross Durrant put Matlock in trouble, Shane Clarke firing wide after Margetts had been closed down. It was the start of an uncomfortable period for the hosts as Byrne lifted a free kick over the bar and Margetts lashed a great chance over the bar from eight yards. A couple of hurried sliced swipes of Matlock clearances indicated worries in their back line and they stayed on level terms when Durrant was out smartly to block an Alex Simmons shot. The pressure eventually told a minute before the break when Byrne’s cross from the right found MARGETTS who remained calm to tee up his shot and slip the ball past Durrant. The second half followed a pattern of Matlock enjoying more of the play but doing precious little with it. Conversely Russell was at the heart of many of the better moves of the afternoon, he was industrious and tidy in possession, comfortably winning the midfield battle. Penalty appeals when King went down in the box were refused and it took until the midway point of the second half for the next chance to be created and it fell to Trinity captain Clarke who shot high over the goalframe from a promising position. At the other end Stainfield did well to head clear with Hinsley waiting to convert Westcarr’s cross from the left with Matlock becoming increasingly frustrated by a combination of refereeing decisions, time wasting from the visitors and their own inability to create anything of danger. Jamie Jackson’s introduction gave Matlock hope, Stainfield heading out his cross for a corner which fell awkwardly for Dwayne Wiley to hook high and wide. Substitute Lee Beevers’ header and a Jackson strike were both deflected narrowly wide as Matlock fought in vain for an equaliser but their hopes of salvaging a point evaporated as Trinity broke at pace and RUSSELL’s shot was adjudged to have crossed the line by the referee’s assistant despite Durrant’s best attempts to keep the ball out. 2019 therefore began disappointingly for Matlock, their failure to keep clean sheets, the last one being back on October 23, is making life more difficult. Generally they have got away with it, this time they fell short.